Offshore banking is the elephant in the global economic room which the political and financial elite is trying to hide from the public view. While imposing austerity measures on hard working citizens, they are well aware that astronomical amounts of money are secretly held in offshore banks, thus lost in taxes. Where is that money from? What is it for? Drug cartels, fraud, tax evasion and money laundering are common answers to those questions. Despite this reality and even in this era of fiscal austerity, the question world leaders avoid is: why is secret banking still allowed? Are they capable of putting a term to it but unwilling to do it because of the benefits it provides? Clearly. Every once in a while a robber baron will serve as a scapegoat to give a pale illusion of justice to the common man. Although they deserve to be penalized, the corrupt banking system which allowed them to operate remains inviolate and its flaws are never questioned. 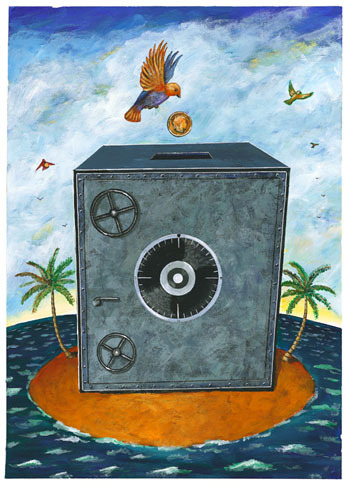 Offshore banking is not a parallel banking structure. It is at the heart of the banking system. All major banks have offshore subsidiaries. Greek magazine publisher Costas Vaxevanis faces charges of violating state privacy laws. Potentially he faces two years in prison. A […] recent Tax Justice Network (TJN) USA report […] estimates up to $32 trillion of hidden and stolen wealth stashed largely tax-free secretly. With the recent images of the brutal Spanish police state in mind we have to wonder if following the corrupt banking industry diktats is a very ruinous ride on the highway to totalitarianism. Global Research offers its readers a list of articles on this important topic. Unlike mainstream media commentators, Global Research has been exposing bank frauds and warned its readers about the 2008 economic crisis. Therefore, we do not receive any donations from the banking industry and need your unyielding support to provide you with insightful analysis and crucial information. Please donate or become a Global Research member!